Usually, when participating in a railtour, it is necessary to travel some distance to join the special train. Frequently this connecting journey will be by rail, with all the worries about missing the tour and/or missing the last train home. So when the "Western Valleys Phoenix" was advertised by the Branch Line Society, starting from Crewe and picking up at Shrewsbury, we needed little extra incentive to book tickets. Basically this train was to be a trip to South Wales, visiting Ebbw Vale and Swansea Docks, returning via the Central Wales Line. Last time we travelled with the BLS, it was on a DMU. There are now relatively few of the "Modernisation Plan" variety left, even fewer in good working order it would seem, and for a year or so all railtours have been loco hauled. Steve and I arrived at Shrewsbury station for the 0738 departure. Running a few minutes early, it was in within a minute or so - a rake of maroon-liveried Mk Is no less, hauled by a pair of Class 37s. All tickets had been offered as standard class; our seats turned out to be in a most comfortable First Class compartment - unknown luxury for a Branch Line tour! We were away more or less on time, and had a pleasant run down the "North and West", arriving in Newport at about 9.20. For the entertainments (diversions?) in South Wales we were to be "topped and tailed" - how would this be arranged? Perhaps one of the 37s would be sent to the other end? In the event, they were led away, and two Civil Engineers liveried 37s, which had been lurking at the stabling point, coupled up to the train, one at each end. This must have looked an unusual train to the casual onlooker - "Dutch" liveried locos, one at each end, then a blue/grey coach - two at one end, one at t'other, with a crimson filling to the sandwich! Branch Line Society tours seem to reach the parts other organisers do not (nor wish to!). This trip was due now to visit the coal and ore terminals at Llanwern Steelworks, and we now proceeded to waste the best part of two hours, attempting (and almost succeeding) to accomplish that objective. Most of the time seemed to be spent standing in the main through loop at Llanwern, waiting for something to happen. I suppose the train did venture onto the terminal lines - barely a trains length! Because of some peculiarity of the local signalling, having visited (!) the coal terminal line, we had to return to Newport station before we could "do" the ore terminal. Much more interesting fare now - the ride up the Ebbw Vale to the tinplate works, last remnant of the once mighty steelworks there, and site for the 1992 Garden Festival (the "Phoenix" in the tour's designation). Until recently, the line was still fairly busy, but colliery closures in the last few years mean that traffic no longer joins at Aberbeeg (from Abertillery), nor at Cwm, where steam survived, albeit in a standby role, until the 1980s. 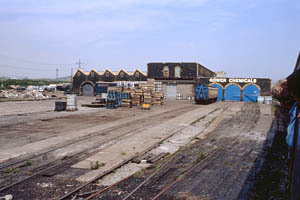 The rails to Oakdale Colliery still exist, though will soon be gone, the colliery having closed in 1989. A fair amount of traffic still goes to the tinplate works, so presumably the branch has a future, despite the decision not to run a passenger service to the Garden Festival. The run up the valley and back is surprisingly scenic, and rural. I heard on the news recently that there will be just three pits still operating in South Wales by the end of the year - I suppose the classic image of the Valleys is now just a memory. Returning to Newport, our path was now westwards, through Cardiff to Margam, where our route was through the freight lines on the edge of the yard. Last time I passed the steel works here, there were one or two industrials evident. The Port Talbot works at one time had a substantial fleet of diesels, including some Alco Bo-Bos dating from the early 1950s. None were visible today though. At Court Sart Junction, a line deviates from the main Swansea Route, the so-called Swansea District line to Morlais Junction diverges. Basically a freight route, it sees some use by trains heading west to Fishguard, not calling at Swansea. I remember seeing a train on the route as we headed for Llanelli, steam hauled, in 1985, on Barry Hodge's trip to Carmarthen. Today we were to follow that route - partially at first, the short distance to Dynevor Junction, and down to the docks, past Jersey Marine and the site of the former Freightliner terminal, coming to a halt at Burrows Sidings box, now disused after some track rationalisation in the area. We paused here to reverse - down the short spur to Ford's Elba works. (Why I am not quite sure!) Alas for the track gricers - coming to a halt by the old loco shed at Dan y Graig, now used by Gower Chemicals, and still rail served, we were informed by the stewards that the driver was not happy about clearances alongside the shed. Presumably he was worried about the coaching stock and its line of heads from the windows. Much wailing and gnashing of teeth. We retraced our steps now to Margam. We had been due to take the route from Jersey Marine South to Jersey Marine West, on the line to Morlais, but this had been refused at a late date by BR. So - all the way back to Margam, where our two class 37s were removed, and a headlight-fitted 47 attached for the Central Wales line. Away again, back to Court Sart and along the Swansea District line to Hendy Junction, northern point of the triangle at Morlais. In many ways the journey which followed was the highlight of the journey. A bitterly cold June 1st had turned into a warm and sunny early evening, and the scenery along the route must be said to be superb. We left Margam running nearly an hour late, however we had been due to wait nearly 40 minutes at Llanwrtyd. We didn't have to wait at all - the southbound DMU was waiting for us. The same happened at Knighton, where we used the recently re-instated loop to pass another southbound DMU. Nevertheless we were some 40 minutes down on joining the main line at Craven Arms, where we stopped to set down passengers for the south who would have missed their connection at Shrewsbury. So we arrived in Shrewsbury about ten past nine - and still daylight! Another good day out, with some interesting and/or different destinations. Highly recommended!